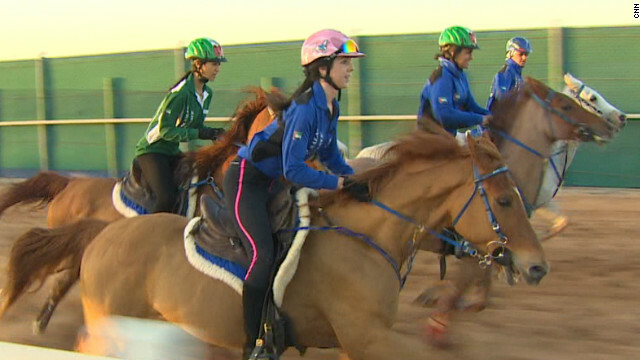 (CNN) -- Purebred Arabian stallions dominate the world of endurance horse events, but it is increasingly likely that the rider guiding them to glory will be a young woman. The United Arab Emirates is the hotbed of equestrian's fastest growing discipline, and new entrants to the top level of the sport such as 18-year-old Fatima Al-Marri are already upsetting the established order. "We love to challenge the men," she told CNN's Winning Post, while fellow competitor Mariam Mothana has another take. "The best thing is when you see the look on their faces when they pass the finish line," Mothana said. "It's nice to see that they understand that the women here can challenge the men -- they can be as strong as men." Some 40% of registered endurance riders are now women, and the bar has certainly been set high for the likes of Fatima and Mariam.